When you’re working with high-pressure steam and hydronic piping, top quality welding is critical to the safety and performance of your heating system. Our professional welders are skilled and experienced, and every welding job is supervised by Gary Frank, the owner of American Boiler Company. Safety is our primary concern. A fire watch is assigned to every welding job. We don’t take short cuts. We take the time to do the job right. We have professional and experienced ASME-certified pipe welders who work with black pipe, stainless steel, galvanized, and other materials. 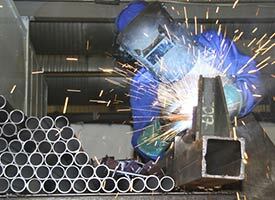 We also provide on-site and custom metal fabrication.